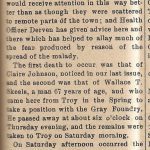 October 18, 1918, The Poultney Journal – One hundred years ago, the Spanish Flu was widespread throughout the world, and the town of Poultney was no exception. In combination with pneumonia, October of 1918 proved to be one of hardship for people of this town and the surrounding area. The situation became so serious that the south room on the first floor of Town Hall was turned into an emergency hospital with the help of Red Cross. To read the original article, click the thumbnail to the left of this paragraph.